Elton Naswood is of the Near to the Water Clan, born for the Water’s Edge Clan. His maternal grandfather’s clan is Mexican while his paternal grandfather’s clan is Tangle. He is originally from Whitehorse Lake, New Mexico, and grew up in Window Rock, Arizona on the Navajo reservation. Naswood is a senior program analyst in the capacity building division at the Office of Minority Health Resource Center, a nationwide service of the Office of Minority Health. Previously, he was a capacity building assistance specialist at the National Native American AIDS Prevention Center and was the founder and program coordinator for the Red Circle Project, AIDS Project Los Angeles. He currently resides in Largo, Maryland, and is a member of the Community Expert Advisory Council for the Indigenous HIV/AIDS Research Training program at the University of Washington, and the U.S. representative leader for the International Indigenous Working Group on HIV/AIDS. Naswood received his Bachelors of Arts degree in sociology and American Indian justice studies from Arizona State University, and attended the graduate degree program in American Indian studies at the University of California in Los Angeles. 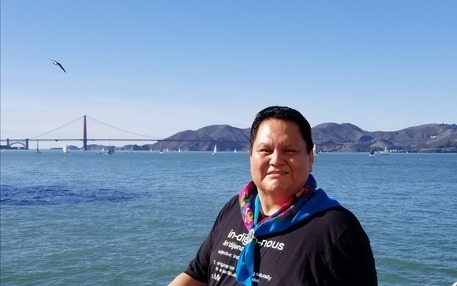 “I also would like to acknowledge the Native providers, advocates, and Persons Living with HIV/AIDS (PLWHA) who have inspired me to do this work – individuals like Ron Rowell, Gloria Bellymule Zuniga, Marie Kirk, Lisa Tiger, Shana Cozad, Tommy Chesbro, Isadore Boni, and the many others who have left us like Kory Montoya and Marty Prairie and those who are still among us. Ahe’hee. Thank you. Though the resources to address our needs are extremely limited or not addressed at all, I know that there are only a handful of organizations funded to address HIV prevention and care among our Indigenous populations and there are no adequate and culturally appropriate resources to build and sustain capacity for Native agencies. This is NOT equitable. Another important example is that way too often, as Native people, we continuously are referred to as “OTHER” and as “statistically insignificant” by federal, state and local health agencies. This is NOT acceptable. WE ARE A PEOPLE! and should always be respected as A PEOPLE. Reprinted from Circle of Harmony HIV/AIDS Wellness Conference.